What are the options for pricing carbon? How is carbon pricing linked to climate change? What’s the right carbon price to mitigate climate change? To see how much information about carbon pricing the Climate Web pulls together, take a look at our Carbon Pricing Deep Dive — and now you can purchase this Deep Dive for download to your desktop! Even if you are professionally involved with carbon pricing and related topics, you are unlikely to have access to anything like the information you can find in the Climate Web! 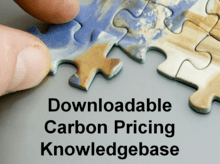 With the Carbon Pricing Deep Dive, you can build a knowledge management system customized to your needs and save many hundreds of hours in populating that knowledge management system.